Merry Christmas Indeed – and it’s a rainy one this year! A growing tradition in our marriage is the creation of the annual “Yacovella Christmas Card”. Going on year number 2 (of the card and our marriage) I proudly present to you the 2008 Yacovella Christmas Card. 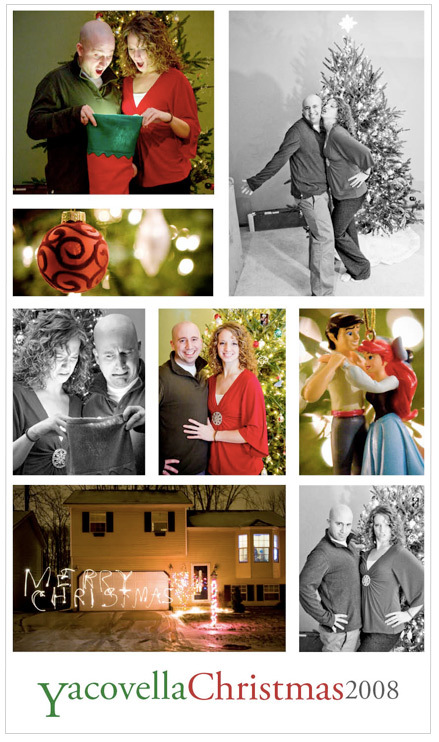 With a little bit of help from my good friend Greg, Colleen and I had a ton of fun taking the pictures this year. I’m especially proud of the work we did on the bottom image, the one involving our house. The writing “Merry Christmas” was written by me using a flash-light, using a 30 second exposure with my camera. My awesome wife stood outside in the cold and gave tips to her husband on how to write “Merry Christmas” backwards while not falling on our icy driveway.